I was excited when I found out that Robert Galbraith was writing another Cormoran Strike novel. I had thought that Cuckoo’s Calling was a single book, not part of a series. It very easily could stand alone, but it also works very well for the start of a series about this man and his mission to make a name for himself. I really enjoy these novels, even though the detective genre is not normally my go-to place for a new book. As I read this story I tried to determine what it is about detective stories that I can’t get into. I love puzzles/riddles and mysteries but for me there has to be more to the story then just who is the killer and why. I love shows like Bones because I love the characters while the mystery aspect takes a back seat for me. And I think that is why I love these books so much. The mystery aspect is important but it is not central to the story, the story is about Cormoran and Robin finding themselves. We left Cormoran on a sort of high at the end of the last novel. He was getting over his breakup and he was starting to make a true name for himself. In this story we see that the image he is trying to create is very fragile, that high and happiness is a teetering tower that could fall over at any moment. Strike is a very independent man. He does not need anyone’s help. When he struggles to get out of a cab Robin knows to let him struggle, he would not appreciate helping him in any fashion. He does not want to live off of anyone else’s charity. He is a veteran who lost his leg protecting his country and he does not want anyone’s pity. He will not see the limitations that stand before him. Strike strives to cover up what he is lacking by showing the world his true capabilities as a detective. If he can get the world to see how good he is at his job, then they will not see what he is lacking physically. This become his goal in life to prove to the world that he is more than a man missing a leg and also that he is more than the son of a famous rockstar; none of that will define him. Strike is the only one who can define himself. Throughout this novel we see him constantly fight with his prothesis He should not have it on most of this book, since it is hurting him, but he will not let others see him without it. He will not be pitied. He will be respected for the man that he is. He also refuses to show how poor he really is. He takes cabs he can’t afford as well as paying for lunches he knows he doesn’t have the money for. Admitting he can’t afford these things is a sign of weakness, something Strike will not show the world. His body and pocket book might not be strong but his mind is sharp and he will get the world to respect him for that. Robin sees the real Strike. She knows how fiercely proud and stubborn a man Strike can be. She doesn’t hold that against him, she understands him. She knows what is means to want to work to show the world your true self. Robin doesn’t pity Strike, she doesn’t let him off when he does things that piss her off. She stands her ground and fights him when necessary. She keeps Strike answering for his actions, which is something Strike desperately needs. He needs someone to put him straight sometimes, point out when he is being ridiculous. Robin is a very strong woman. In the last book we saw her kind of searching for herself. She had just gotten engaged and started a new job. She was trying to fit herself into these new roles. Now she has determined how she wants to not only play these roles but how she wants the rest of the people around her to see her. She wants to be a detective and she let’s Strike know that. At first she is hesitant about it, getting offended when he doesn’t offer to train her. But she doesn’t let that stay holed up inside of her for too long, she opens her mouth and tells him what she wants. She fights him when he tries to change her mind. She wants this and she isn’t going to walk away because of potential issues that might arise. When Robin wants something she goes after it. In this book she puts her relationship in jeopardy because she is so focused on this one goal. Robin is not going to choose between being married and having this career. She will have both. She wants Strike and Matt to get along to make her life easier but when they don’t she doesn’t decide she has to choose between the two. She understands both sides and becomes determined to work with both of them. Robin really steps up in this novel, she finds herself and her voice which is always nice to see. I like Robin because she does not let the obstacles get in her way. She sees them, analyzes them and determines the best way to move them out of her way. The actual mystery part of this novel was interesting. A writers goes missing and ends up dead. Everyone becomes a suspect after it is discovered that in his latest novel he basically destroys everyone that is in his life. I won’t reveal too much about the details but I will say it was an interesting take on how easily people will judge someone based off what they write. People sometimes have a very difficult time separating fact from fiction, and when there is any resemblance to a real person then latch on and run with the comparison. When things don’t fit they make them fit. It is an interesting take on the idea of separating an artist from their work. I enjoyed this novel very much, because as I stated before you get completely wrapped up in the lives of Strike and Robin. Both of them are real, breathing people you could find in the street, the store or at the movies. You turn pages because you want to see what happens next in their lives. You root for Robin to get what she wants and you want Strike to show the world who he truly is. You become invested in their lives, making it simple to get lost inside of the pages of The Silkworm. 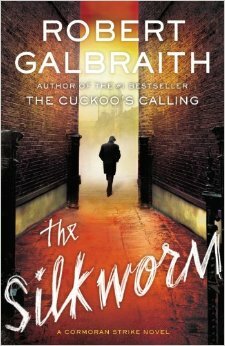 Posted on July 14, 2014, in Book Reviews, Thriller and tagged Book Review, detective story, fiction, J.K. Rowling, novel, Rober Galbraith, The Silkworm. Bookmark the permalink. Leave a comment.